Extrapyramidal is a term that describes the neural network, which is a part of the motor system that is outside the pyramidal tracts in the medulla. Extra means outside, thereby extrapyramidal system arises outside the pyramids of the medulla. The involuntary movements and reflexes of the motor system. The extrapyramidal system lies outside the motor cortex that passes through the corticobulbar and corticospinal tracts. The pyramidal system is responsible for the direct innervations of the motor neurons while the extrapyramidal system is only responsible for the regulation. 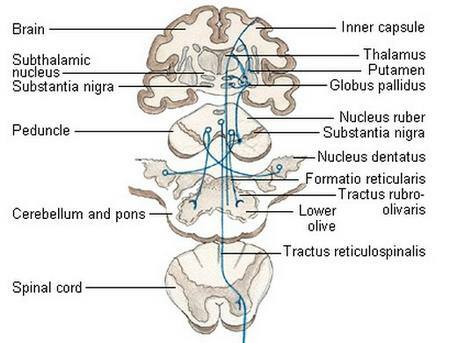 The extrapyramidal tract is mainly located on the reticular formation of the medulla and pons. It is also found in the spinal cord areas, which are responsible for locomotion, reflexes, postural control and complex movements. The extrapyramidal tracts are in turn regulated by the basal ganglia, nigrostriatal pathway, vestibular nuclei, sensory areas of the cerebral cortex and the cerebellum. These areas and regulatory sections are all parts of the extrapyramidal system. The extrapyramidal system regulates the motor activity even with the absence of direct innervations with the motor neurons. Akathisia. Akathisia is a condition of motor restlessness. Akathisia may involve urge to move constantly, inability to sit still, or feeling of shakiness or jitterness. The restless movements usually lead to exhaustion and may predispose to suicide because the patient may not be able to bear the severe akathisia. Acute Dystonic Reaction. Acute dystonic reaction involves muscular spasm of the neck known as torticollis. The patient experiences severe pain on the neck when trying to move it. The eyes may also be affected leading to oculogyric crisis. There is also spasm in the jaw and tongue. This happens because of lack of modulation of muscle contraction leading to over contraction and muscle spasms. Dystonia may be severely painful. Spasms of the tongue and jaw may also lead to drooling. Pseudoparkinsonism. Pseudoparkinsonism is a false Parkinsonism disorder caused by the intake of drugs. The true Parkinson’s disease involves the problems in the nigrostrial pathway. However, because of dopamine deficiency, there is dysregulation of the extrapyramidal system. The extrapyramidal system is responsible for skeletal muscle tone and posture. Affectation of which may result in bradykinesia or slow movements, lead-pipe rigidity, postural instability, mask like face, shuffling gait and resting tremor that are similar to true Parkinson’s disease. Tardive Dyskinesia. Tardive dyskinesia is asymmetrical and involuntary movement of muscles. Tardive dyskinesia is a chronic, irreversible condition and usually occurs after the long-term use of certain antipsychotic medications. Tardive dyskinesia may include lip smacking, fly-catching movement of the tongue, eye blinking, finger movements and arm and leg movements. Tardive dyskinesia is usually recognizable. The Barnes Akathisia Rating Scale as well as the Simpson-Angus Scale measures the severity of the extrapyramidal symptoms. Antipsychotics – Antipsychotic medications such as haloperidol, thioridazine, and chlorpromazine are medications used to treat psychoses or schizophrenia. Antipsychotics are also used to manage symptoms of Alzheimer’s disease. The use of antipsychotics reduces the level of dopamine in the brain leading to extrapyramidal side-effects. Typical antipsychotics most commonly cause EPS than atypical antipsychotics. Antidopaminergic anti-emetics – This medication reduces the functioning of the dopaminergic neurons. An example of which is metoclopramide. Tricyclic antidepressants – Amoxapine, a tricyclic antidepressant drug also causes extrapyramidal symptoms. Other causes of EPS may include cerebral palsy and brain damage that affects the extrapyramidal system. Extrapyramidal symptoms usually occur after the intake of the above medications in a few hours or even up to years of treatment. Anticholinergic medications – Anticholinergic drugs are given to patients to reduce extrapyramidal symptoms, specifically pseudoparkinsonism and dystonia. Acetylcholine is responsible for muscle contraction; thereby inhibiting its binding to its receptor sites reduces muscle spasms and twitching. Anticholinergic medications may include benztropine or Cogentin. Dopaminergics – Dopaminergics are medications that increase the binding of dopamine to its receptor sites, thereby reversing the effects of decreased dopaminergic activity. These medications include diphenhydramine, or trihexophenidyl. Beta blockers – Beta blockers such as metoprolol are also given to reduce EPS. Benzodiazepines – Benzodiazepines such as valium may also be given to stabilize the nerve impulse transmission to reduce motor restlessness. Medication modification – Switching from typical antipsychotics to atypical antipsychotics is very essential for those needing continued treatment for psychosis. Atypical antipsychotics do not produce extrapyramidal symptoms and are as equally effective as the traditional neuroleptics. Atypical antipsychotics or neuroleptics include ziprasidone, aripiprazole, risperidone, olanzapine, clozapine and quetiapine. These medications do not result in the affectation of the nigrostriatal pathway. When medication modification is not possible, reducing the dose of typical neuroleptics is done.